Traveling as much as I do, I am constantly amazed at how God provides opportunities to be with family. I'm on a two and a half week trip away from home, yet unexpectedly I have over a week with Matthew in Haiti. We started out on Thursday to get here before Hurricane Tomas, but God had other plans and we arrived here yesterday after the storm had departed. 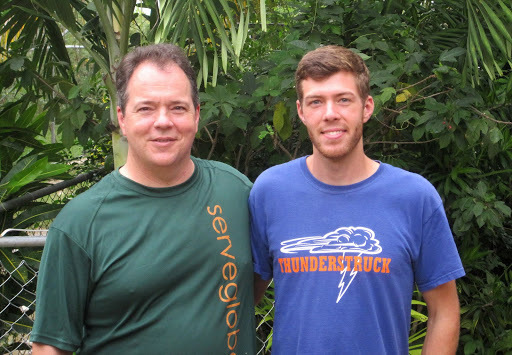 So father and son have a chance to do ministry together, share life together in Gressier Haiti and have the time to talk about whatever comes up. This is a blessing we never expected and recognize is a gift from God. People sometimes ask Cathi and me how we can stand living so far away from our older kids. What we have found is that the distance keeps us from taking connections for granted. Between regular phone calls, Facebook, and those God-given face-to-face surprises, we find that the distance isn't great at all.